Punk rock – good punk rock – is about quick hits, an egalitarian ethos, and hard work. By those standards, Casa Azul, located downtown at the corner of Genesee and N. Oak St., is one of the more punk rock restaurants to come along in some time: It’s all-killer-no-filler servings are delicious but compact and its price point is very approachable, apparently due to hard, long hours put in by its staff. 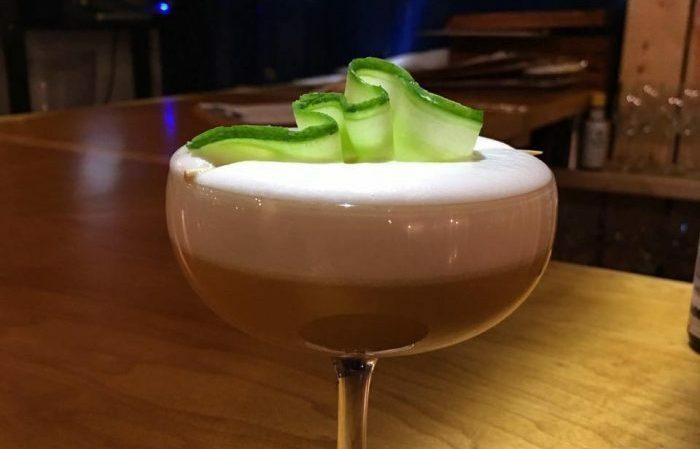 If the opening of the ground floor taqueria was Casa Azul’s London Calling, then surely the recent opening of its bar and upscale service is the restaurant’s Sandinista! The thundering beats and primal screams of Mexican street food tacos can still be had on premises, and now you can climb the stairs to enjoy a wider range of influences, even modernist vegetarian fare. To check in on la fase dos (phase 2) of Casa Azul, I recently sat down with co-owner Zina Lapi in the second floor’s contemporary, minimalist dining room, which seats about 50 people. Born and raised in Western New York, Lapi spent two years cooking in Miami and two years in Rhode Island after coming out of culinary school. She came back to Buffalo to work at Mike A at Hotel Lafayette, and then do a stint in the kitchen at Buffalo Proper before launching her Blue Balls food truck. With Casa Azul being one of the first restaurants in Western New York to offer two levels of food service – both casual and upscale – the many sounds of Lapi’s diverse background have suddenly locked into harmony. “On the truck, it was very fast-paced and success was dependent on how I could get food out quickly without reducing the quality of the item. That’s kind of what we downstairs in the taqueria,” she said. For the upscale service, Lapi said she draws heavily on her experiences keeping the beat for Mike Andrzejewski and Ed Forster at the Hotel Lafayette. 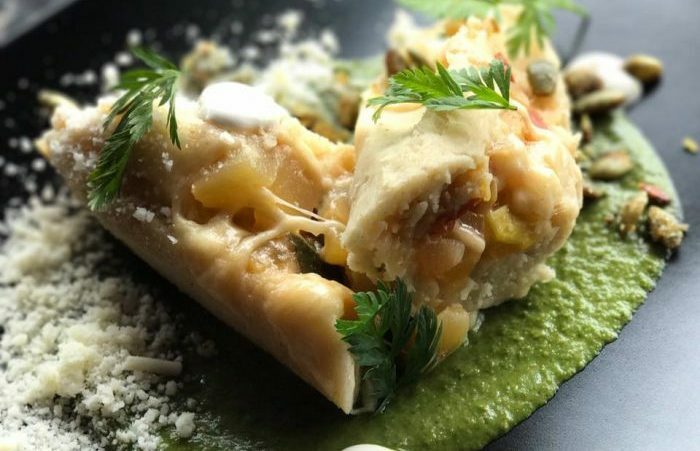 In addition to working with two different concepts under one roof, Lapi also has to regularly collaborate with her co-owner, the Mexican-born chef Victor Parra Gonzalez, who also owns Las Puertas, an upscale Mexican eatery on the West Side. Their collaboration sounds kind of like a two-person Instagram account; with either chef ‘picturing’ a dish and Gonzalez in charge of picking out the culinary filter. “Then we just throw things at the wall until they stick and we’re both happy,” she added. The resulting menu at opening contains mostly refined takes on conventional Mexican dishes. 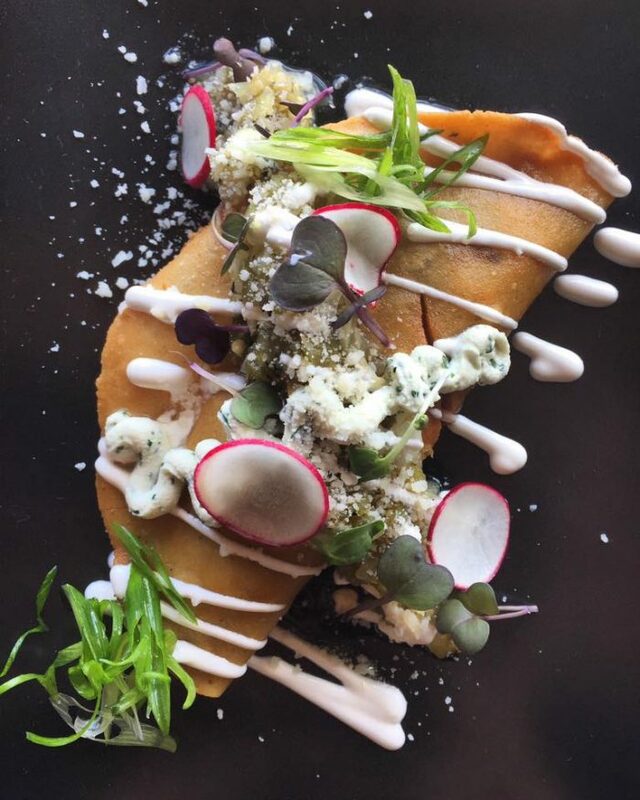 There are masa mushroom quesadillas, housemade chorizo and chicken enchiladas made with confit chicken. 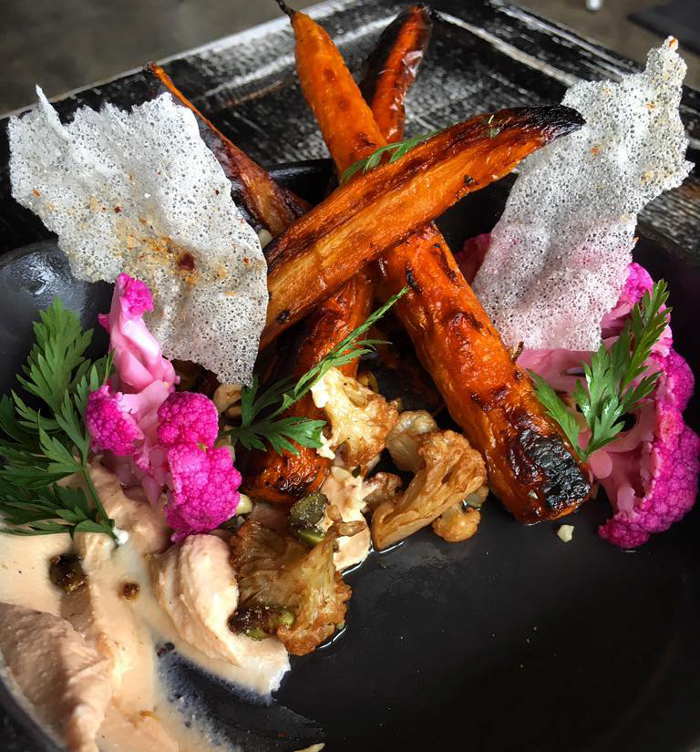 One particular menu standout is the vegetable-based “escabeche” – which includes blistered carrots, charred cauliflower, pickled cauliflower, housemade requeson cheese, a rice chicharron, and candied pepitas. 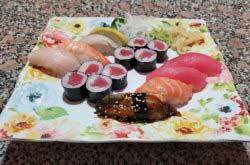 The dish might seem simple at first glance, but Lapi explained that it is rather involved. 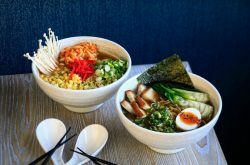 “When you see it, it’s a beautiful dish, but you don’t necessarily know that there are five different cooking techniques that went into it and days-worth of process,” she said, adding all of that time and technique can be had for $8 per serving. Truth be told, serving sizes at Casa Azul haven’t been massive, and the enjoyment of your dining experience may depend on how you define value-for-dollar. Is it important that you walk out of a restaurant with a bulging stomach, doggie bag in-hand? Or do you value unique flavor combinations and presentations delivered through skill and experience? Those who prioritize quality over quantity have a better chance of being satisfied at the end of their Casa Azul visit. 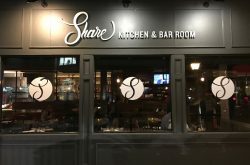 An emphasis on quality can also be found at the restaurant’s modest 8-seat bar. Operating under the watchful eye of Joe White, a Buffalo Proper alum, the bar emphasizes classic Central and South American cocktails. 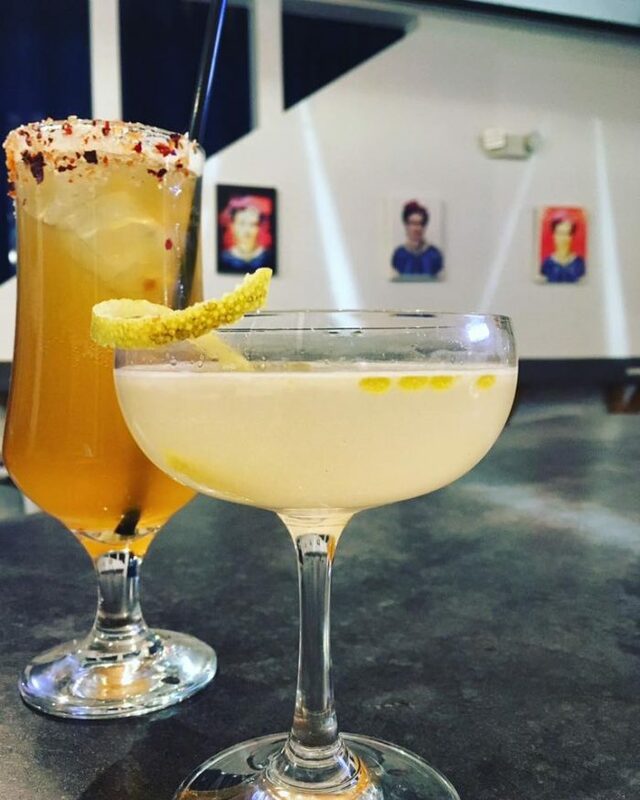 However, the bar truly sets itself apart through its micheladas: The range of beer cocktails are crafted with housemade ingredients, like gazpacho and tepache, a fermented pineapple drink. 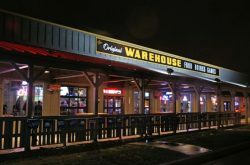 White said his bar prioritizes both freshness and minimizing food waste, noting that there’s “over-prepping being done” at a lot of other bars in the area. He said he would rather have his bar juice fruits on-the-fly than create a cache meant to last multiple days. The bar at Casa Azul offers an approachable price point, which is supported in large part the hard work of its two-person staff. “Like everything else here, I feel like we’re pricing things very fair so people can come and enjoy them,” White said. In addition to not expecting gut-busting portion sizes, guests should also be prepared for the bleak parking options nearby. 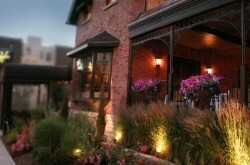 There are a few lots in the area and Lapi said she thinks her restaurant is “worth the walk” from any one of them. For more info and updates to the menu check out Casa Azul’s Facebook page. Restaurant hours: Monday – Thursday 11:30 a.m. to 11 p.m., Friday and Saturday 11:30 a.m. to 12:00 a.m.
Bar hours: Monday – Thursday 4 p.m. to 11 p.m., Friday and Saturday 4 p.m. to 2 a.m.